In Modern Editor you can make an email address into a mailto: link in any text or image block. It's easy to link to an email address in your design. The technical term for these links is mailto: links. These are added just like any other link in your design inside an href field. When your recipient clicks the mailto link it will open the default email client on the device with the email address populated in the To: field. Note: Mailto links cannot be tracked like other links to your website because these links open in the default email client. You can add a basic mailto link to your email or page design right inside Modern Editor. You can even add a an email subject line and email body content in the mailto link. 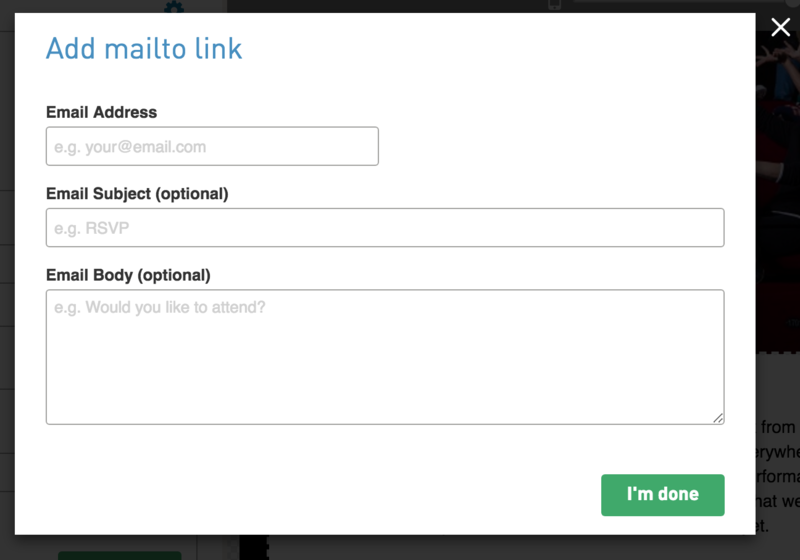 Easily add an email mailto link into your design using tools in Modern Editor. 2. Click on any text or image block field in your design from the preview panel (right side). 3. Find the href field on the edit content panel (left side). In image blocks, the href field will appear on the edit content panel. 4. Above the href field you will see a Mailto link with an email icon next to it. Click on this link. 5. A window will appear to help add a mailto link. Fill in all the fields as needed and click I'm done. Enter an email subject line in the Email Subject field. This will automatically populate a subject line when the mailto link is clicked. This is optional. Enter email body content in the Email Body field. This will automatically populate body content when the mailto link is clicked. This is optional. After clicking I'm done, your mailto link will be added to your text or image block href field.